Grace Surtees has everything carefully under control – her work life, her home life and her love life – especially her love life. But then her boss hires Tate Saunders, a brash American, to spice up the gallery tours his company provides. Messy and fond of breaking rules, Tate explodes into her tidy existence like a paintball, and Grace hates everything about him . . . . . . doesn’t she? Because, for Grace, the alternative would be simply too terrifying to contemplate: to love Tate rather than hate him would mean leaping out of her comfort zone, and Grace’s devotion to order hides some long-kept secrets . . . secrets she’s sure someone like Tate Saunders could never accept or understand. I absolutely loved Hazel Osmond’s two previous books, they have left a lasting impression on me and I often recommend both Who’s Afraid of Mr Wolfe and The First Time I saw Your Face to people who are looking for a fantastic read. I have been eagerly awaiting the release of Playing Grace so as soon as it arrived on my door step I couldn’t wait to get started. Grace has everything in order, she likes her routines and feels settled when things are going smooth, but when her boss employs Tate who is polar opposite to Grace he comes in like a whirlwind and puts Grace on edge. With conflicting emotions her heart was falling for live wire Tate but her head was screaming at her to keep to her calm and stable ways something that doesn’t seem possible with Tate around. Grace was like a delicate wall flower and I think me and her have more in come than I would like to admit there were a couple of times during the book where her barriers began to crumble and one particular time involving the office chair did show a more fun loving side to her. Tate was an entertaining and slightly mysterious character who I loved. The supporting characters in this book were fantastic and a little quirky, and the shocking twist surrounding Alistair was unpredictable and was a great part of the book. My favourite part of the book though was when the story turned to Violet who was only a small character in this book but an intriguing character none the less and I was left wanting to know more about her story. The story is based around the art world which is not an interest of mine so when the book began I was unsure how I was going to find this book but I was determined to keep reading. 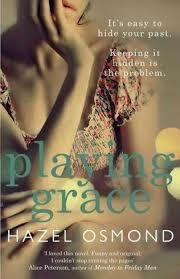 I did enjoy this book but I wasn’t blown away with Playing Grace like I was with the previous two books. It was still an enjoyable read and I found myself easily flying through the pages so there was nothing bad about the book but it is just not one that has left any lasting impression on me. I would recommend reading this book as it is a light enjoyable read with some fantastic characters and some great twists and turns.